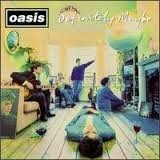 I'm definitely maybe indifferent about Oasis reforming or re-releasing their album. However, my gast was indeed flabbered to discover how long ago it was originally released. This also means it's been 20 years since 'Parklife' by Blur! I read an article last night that compared us listening to "old albums" to the "old albums of when that album was released" - it sounds confusing but it's not. It's like if you listened to Michael Jackson's Thriller now, the album of the same age when that was originally released was Elvis Presley's first album. Intriguing stuff!! Ooooh do you have a link, Nickie? Nickie, thats pretty cool stuff! My first ever "proper" favourite album was 'K' by Kula Shaker. It came out 18 years ago. Can we just pretend that was when I was born? I am young, honest.